It’s been an intense, beautiful and long winter this time. What could it mean for the travel happy? 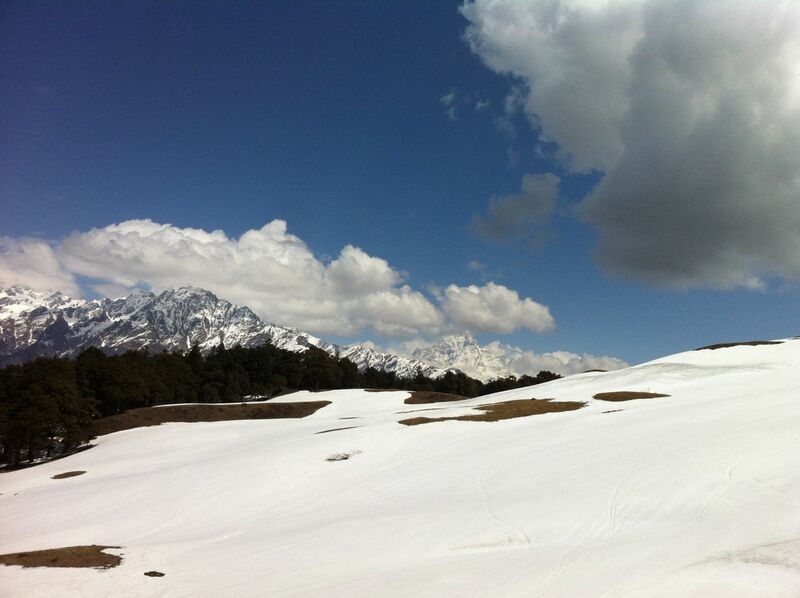 That on one hand there is still snow in north India. On the other, the desert regions have kept scorching heat at bay are still visit friendly. What with another long weekend approaching at the top of April, it might be the last chance to make a dash for the two seasonal beauties-the rolling hills of snow or the magic of desert dunes. I have been lucky to catch quite a bit of the desert this year. 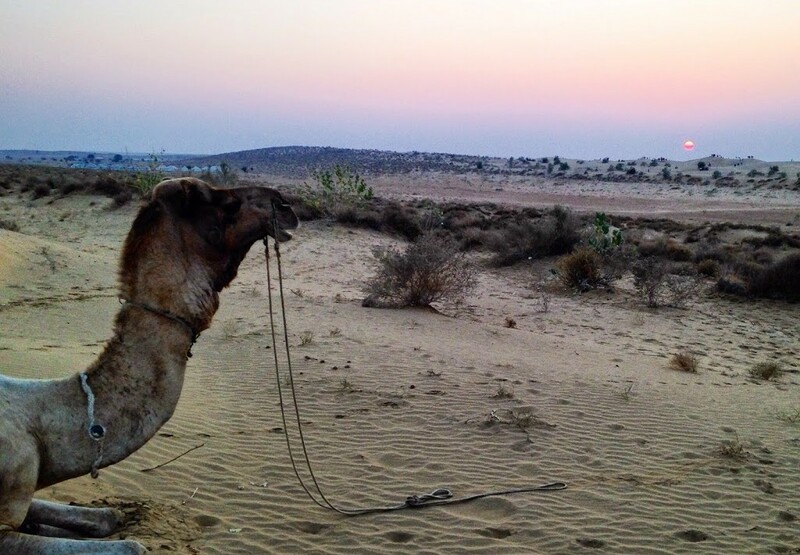 While you can enter the dessert from many places, one of the popular routes is a few hours away from Jaisalmer. If you have at least 2 days to do a camel safari, then try out the Desert National Park. Permissions will be needed to explore and camp, but all is easily available. The locals are lined up to help. If time and inclination is of concern but you still want a quick shot of the unadulterated experience, then try it out for a day. 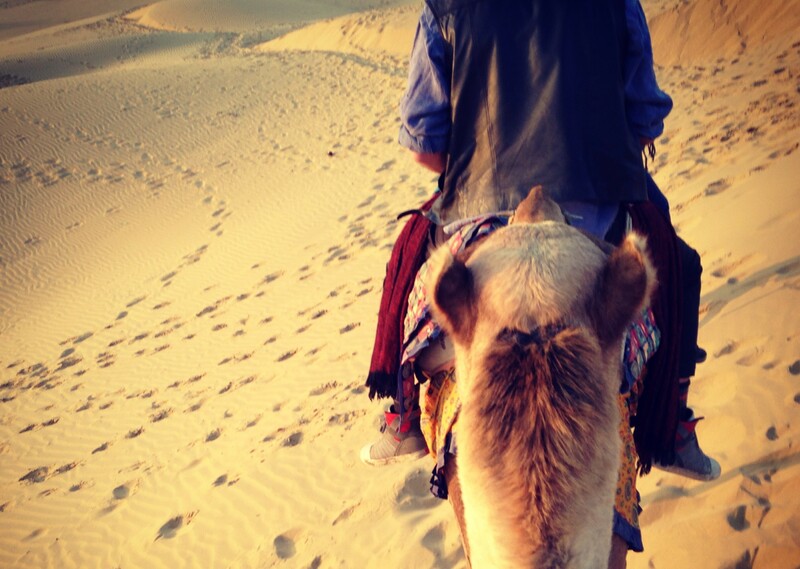 You will get only as far away from the sound lights and highway as the camel carries you in that much time. But you will still make a unique memory. 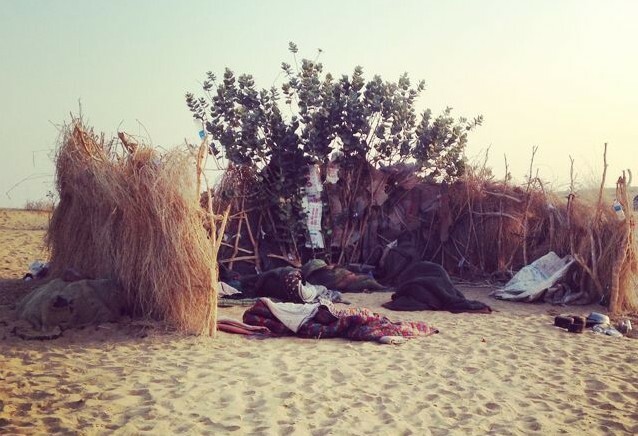 If you approach Sam from Jaisalmer, you will see many large camps. Running in full swing with luxury tents, bathrooms, music, DJ, buffet and the works. 10 years back when I did this, it was still a novelty. There were only few camps and the crowd was just about discovering this. But now, Sam in season and sunset time is almost as crowded as the VT station in peak hour. So this time I tried the solitude route. A camel owner and his helper, few camels, very few people, and in the middle of nowhere. And what a night. Once the safari is done, you can settle down to a peaceful walk around the dunes. Watch the sunset. Chat with the camel owner and some villagers who might cross by. And then its about sleeping under the stars. This time of the year the weather might be perfect for it. They will give you mats and blankets. But it is best to carry your own sleeping bag if you are finicky about sparkling cleanliness. I visited in the peak of winter and I was grateful that my travel partner happened to also carry a tent. Boy, did I enjoy pitching it! The food is cooked fresh as you gather around the fire, chatting with the locals and like-minded others who might have come along for the safari. The quiet crackle of the wood, the clank clank of the pots and pans, rustic weather- beaten stories all add up to make it a night to remember. And the food. All of it. Dinner, tea & breakfast. Organic. Earthy. Delicious. I would highly recommend this for an off beat experience. The locals call it the non-touristy safari. And surely there aren’t many doing this circuit as of now. 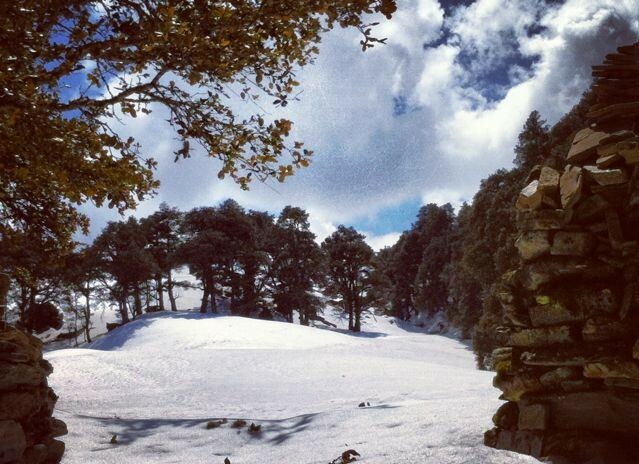 It is an experience where nature calls truly means finding your spot in the nature. No beds. No bathrooms. No showers. No establishment. And no boundaries. All you have is golden silence, your own loud thoughts and a good campfire under a star lit sky. I haven’t caught the snow this year. Hopefully will catch it in the coming long weekend. But around this time of the year, I have frequently run towards the white lands. Because this is the time when you can enjoy the snow without running into a storm or a blizzard. There are so many places one can go, to get a good dose. Himachal, Uttarakhand, Kashmir, Ladakh. See whichever suits you. For me, I would love it to be a good drive away. Road trips are always my weakness. And I would love a place that would give me options of both solitude and a little bit of activity. 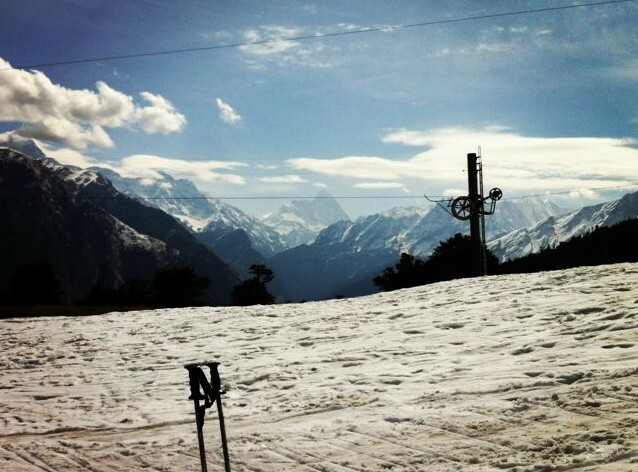 These are images from Auli. 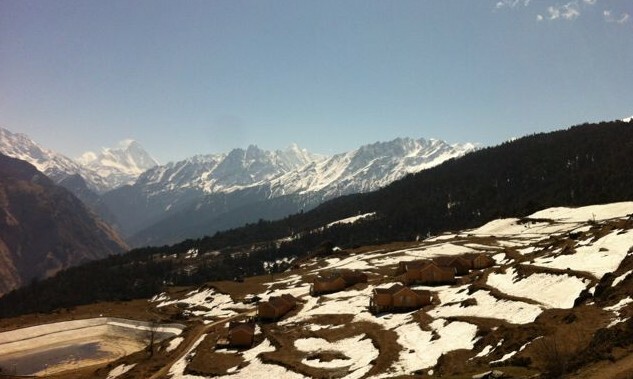 A ski destination right at the top in Uttarakhand along the Badrinath route. I had last visited it in wee end of March a year or so back. It is a long distance up from Rishikesh. But it is worth it. Once you are there and done with gazing at the vast beauty, there are beautiful walks to take. Nature is in full abundance and the camera friendly folks might just go slightly crazy. The ski lift, specially the open -seat ones are a pure adrenalin rush. And of course, learning to ski is always an option there. The gears are easily available on rent, and also helps the local youth earn a buck. Try it out. The fun part is the harder you fall, the better the Maggi tastes afterwards from the make shift shacks. 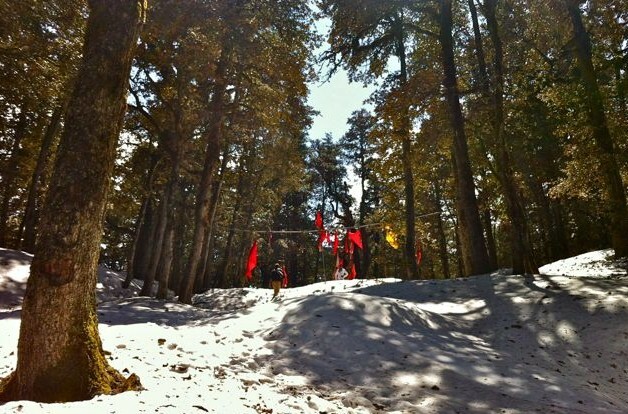 And if you have more time on your hands, trek up in the forests. Carry water. Carry good health. Carry stamina. Because a few hours in the snow is as tiring as it is fascinating. You will eventually come to a flat land with sheets of snow till your eyes can travel. And no sign of any human being. And that is where you can open your snow boots, get on top of a rock, and feel that tingling feeling. I precisely did that. Took off my wet snow boots, stretched and whisked out my DSLR. Before letting out a big happy sigh. Do write to me in case you need any more details on either the white valley or the gold. Have a happy long weekend. Great new look of ur website. The sands and snow look so enticing. Replying late, but replying nevertheless 🙂 Was out traveling. Thanks for dropping by my blog. 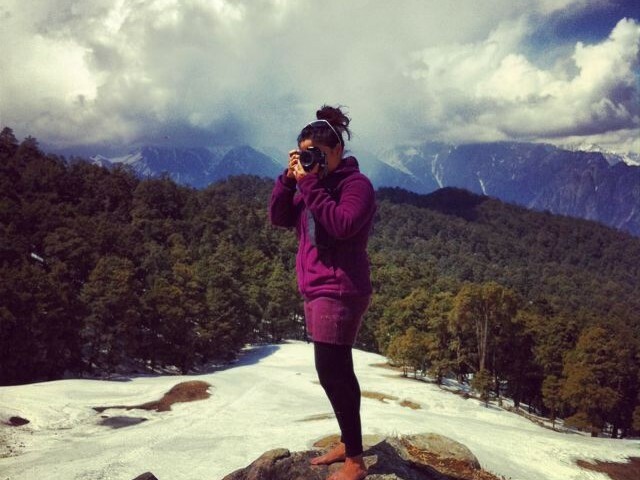 First of all – I love your travel photos Debbie. I will be doing a Rajasthan tour on a motorbike in Nov 2015. 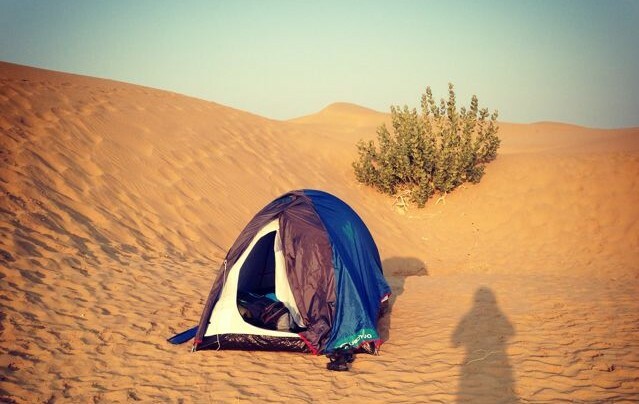 I do want to visit the splendid deserts but instead of taking a camping package, i would instead like to pitch a tent on my own there and spend the night on my own in the desert (thinking of a place somewhere near the desert national park). I can bring my own food and water for the night . From your experience, would that be possible or even recommended? To get into Desert National Park you will need permits etc, for which you will have to get through locals. 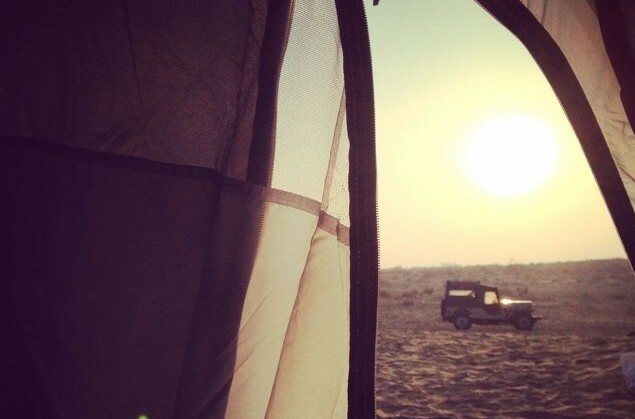 To camp outside, a little away from the highway, in Sam, in the more desolate dunes, should be possible on your own. But to navigate through the dunes, on a bike, might be tricky, without local help. But it’s always nice to employ some locals [ because their livelihood is scant], and let them cook for you etc. 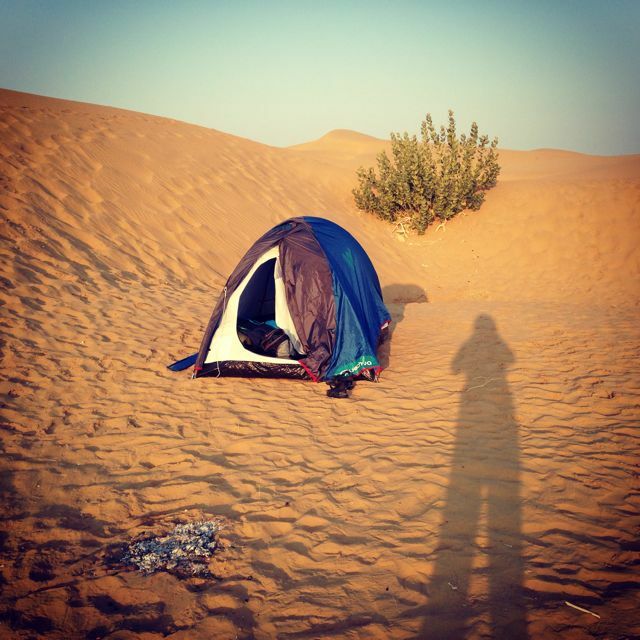 I hired a camel owner, who took me and another Australian couple a little bit off the beaten track, gave us some freshly cooked food in the desert, and left us on our own, with a little fire. I had carried my tent, so i pitched it. In case you want some numbers, let me know.